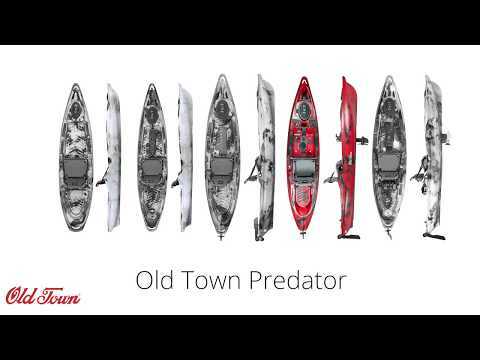 The Old Town 2019 Predator PDL Kayak is bringing hands-free fishing to the Predator kayak family. The Predator PDL hull was designed in conjunction with the PDL Drive for the perfect combination of stability and speed. It will get you to your favorite fishing spots quickly and efficiently and and the seamless forward and reverse will give you exact boat control in wind and currents. The drive installs in and seconds and can be tipped up out of the way instantly for obstructions and shallow water docking. Coming in at 21 lbs, the PDL Drive is so lightweight that it will even float. In addition to the new PDL drive, the Predator hull still has everything you love about the Predator series including the Element seating system, center console, mounting plates, and generous storage options. The Predator PDL comes with the pedal drive and rudder so you are ready to get out on the water fishing right away. Improved rudder control knob featuring a trucker-style spinning handle for easier turning and a screw-lock feature to quickly secure your rudder in place. Industry Best 5-Year Warranty on PDL Pedal Drive. Features PDL Drive for hands-free fishing with Industry Best 5-Year Warranty on PDL Pedal Drive. The only problem I have with this product is YouTube videos stating you can stand up and fish out of these. These are what they are. A kayak/canoe. Not much better for stability than that. If you fall out, you're not getting back in till you get to the shore. Don't take more than a couple good rods out at a time. Drive system is great... but it's still a canoe and one big ski boat will send you and your gear overboard. This is the 6th kayak I've owned. But, this is by far the best fishing machine I've ever peddled or paddled. I love my predator 13 but wanted something foot powered for trolling. This thing rocks! It's fast, stable and roomy. I can promise you it's going to take my fishing to the next level. Wow, I am impressed with this Kayak. It is stable, and I am able to stand at will. I would strongly recommend this yak. Love this kayak, more room than my Native Slayer 13, very stable, pedal is smooth, would have given it a 5 but rudder system still needs a little work. Must keep your hand on the steering lever as rudder is pretty loose. If you start to pedal backwards the rudder turns on its own. Going forward, if you let go the lever rudder will turn quickly which, if not ready for it can make you feel your going to turtle the kayak. Will be working on tightening up the lever. Other than that, kayak is perfect. Love this kayak. Have gone out twice and it preforms great. Also, let me say that Austin Kayaks customer service is also great. They are quick to respond to issues. Having said that, I have to add the negative. My first predator arrived with a 9 inch slit in the bow, all the way through. Sent a picture in to Austin Co. and they immediately ordered a replacement. The second kayak arrived with a smaller gash in the bow, not through but bad enough to be felt from the inside. Ack sent me a welding kit no charge. It's disappointing to spend this kind of money on something and have to deal with this kind of issue. Imagine buying a new car, having it arrive with the door dented in and having the dealer give you a hammer to bang it out. Sure, it still runs, but it's just not the same. I started kayak fishing five summers ago. My first kayak was an Ascend FS10 sit-in that I bought from Bass Pro Shop. The Ascend was a good starter kayak for fishing some of the rivers and smaller lakes around my home here in Missouri, but I wanted to be able to fish Lake of the Ozarks, Table Rock Lake, and Truman Lake without being beat to death by heavy boat traffic and the wind. Trying to control a small kayak while landing a fish in the wind was getting the best of me! I started shopping around for a bigger sit-on-top kayak and discovered Old Towns Predator PDL, Hobie's Mirage Pro Angler, and Native Watercraft's Propel kayaks. Hands free fishing, right up my alley! I studied all of these for a year and even went to a couple of showrooms to check them out and I kept coming back to the Old Town. I went to visit my mom, who lives at Lake Havasu City, and had an opportunity to rent a Hobie Pro Angler with the upgraded Mirage System for a day of fishing. That day there was a sustained wind averaging 20-22 m.p.h. which was just what I was hoping for since I wanted to see just how "hands free" the fishing would really be. It handled well, but for me it was too big and boxy and although the Mirage system is a cool concept, I was pretty exhausted when the day was over. Once back home I decided to go with the Old Town Predator PDL. I purchased it in July and have since then rigged it with a Humminbird Helix 5 G2/SI/GPS, HD trolley system, Yak Attack rod holder, hinged tackle crate with 3 extra rod holders, an Ozark Trails cooler, and a C-Tug cart to haul it. I've had it out six times on three different lakes and one large pond and it handles extremely well, even in strong winds. To me the peddle/prop system is so much more of a smooth fluid motion than the constant back and forth movement of the Mirage system. All and all, I'm very happy with my decision and just wish I could get out more often. What ever kayak you decide to buy you should give Austin Kayak a shot. I've e-mailed them with numerous questions and I have purchased several other items from them and I have always received prompt and accurate service to my questions and my purchases. this kayak and its drive exceeded my expectations. It's everything I was looking for in a fishing and traveling kayak. Moves through current very well. Handles 2-3 swells, even with the high seat it's stable feeling. Usually a very stable kayak means a slow kayak, that's not the case with the predator, it has a perfect blend of speed and stability. Standing is rather easy. Rudder control is smooth. The drive is very smooth and effortless, with only the slightest of noise. The only negative is weight. At over 100lbs it is a chore to transport this kayak in the back of a truck and to the water but certainly doable with a good cart. That's the price you are paying for the extra width and tri hull stability vs a lighter Native Slayer. Doesn't get out the hole like a Hobbie Kayak, less torque, but it's a faster and smoother top end and cruising speed than a hobbie pro angler. Once you get going it'll out run a pro angler and slayer propel. PDL is the smoothest most effortless drive I've used. Easy and quick to take the drive up. Only time will tell the durability, but so far so good. This is a great kayak ! Turns on a dime and fast also ! OT also has great customer service!! Old town predator PDL. got this kayak a couple weeks ago from Austin kayak. ariived in perfect condition. I owned a Nucanoe Frontier 12 before this. I loved it but the pedal yaks seemed to give you much more boat control. Boy was I right! This thing is fast, stable, and there is tons of room for gear. Love the ease of mounting a fishfinder. I have been out a total of four times and each time I love it even more. The pedal drive is easy to pull up when in shallow water and the water tight compartment is perfect for my wallet and keys. This thing is awesome and well worth the money. Get an extra prop just in case. Great fishing Kayak. I have owned the Hobie PA12, Wilderness Systems ride 115, Solo Skiff, and Old Town Predator MX. This Kayak completely out fishes the rest. Having the ability to go in reverse quickly is a game changer. I have had it on lakes and rivers and it is just great on each. It paddles well too when the water becomes a bit too shallow for the drive. Another HUGE plus is Old Town's customer service. I could not find replacement props for sale at any retailer, so I called to get the run down on what to do if I break one. They told me they could sell them to me directly. I was going to order just one replacement thinking they would be a bit pricey, but to my surprise they were less than $5 a piece! I ordered a dozen!!! I also had to contact them a few years ago about some seat issues on my MX, and they sent me a kit that fixed the problem free of charge. This is the kind of customer service you want when spending this much money on a Kayak. Also worth mentioning is the staff at ACK. They are very knowledgeable and always very helpful in assisting you with any projects you have going on. Purchased one in Urban Camo on Black Friday, when price was discounted (plus extra discount for package deal, PFD and paddle). Have it tested finally at local reservoir, so it's first impression feedback. Our area is quite windy most of times; wind was blowing just below 10 mph earlier that day, but it doubled up to 20 mph with some gusts over it later in the day. Kayak handles very good with light chops and wind below 10 mph; however, I had to control the rudder all the time with 20 mph wind and chops up to 2', and response was somewhat sluggish (which is understandable for that condition). Seat is comfortable; more than enough space to store gear. Kayak is very stable; I had to pedal about a mile with side wind and chops while returning to the ramp, and it did quite well, even though I had some scary moments (from my short kayak experience, and I know I wouldn't handle it this way with my 10' Pescador). Speed-wise, it is comfortable 4 mph pedaling; you can go faster but need to push pedals really hard for that (again, my testing conditions were useful to test the real-life limits but far from ideal, with head or side wind mostly). I've installed an anchor trolley and some gear tracks; had to improvise for my Garmin transducer. Yes, kayak is on heavy side, but I have a trailer so do not have to lift it too high for transportation. Build quality is great. Overall, I'm glad I got it, and will recommend it as a fishing platform. I previously owned a Predator MX, which was a great yak, but I eventually got tired of passing spots and having to put my rod down and paddle back around to float by the same sport again, especially with a wind. Now with the PDL , I can reverse, go around..whatever I need to stay on target longer and cover the water I want to fish more efficiently. Granted, as some reviews may tell you it is hands free, well not exactly. The rudder has to be operated fairly continuously to stay on target. But, this kayak is so much more than the regular paddle models. The pedaling is easy and the seat is very adjustable to make the leg movement more efficient as well. This kayak is solid and well built and you see it just walking up to it the first time. The pedal unit, is easy to tilt up to remove debris from hydrilla etc; and when putting back in to the dock or shore. I love the small storage space that is included in the pedal drive. Very handy for phone, camera, lotion , snacks etc;. The sewn in bag behind the seat seems like an improvement with all weather material. The hatch under the seat is or can be very handy, but it is hard to get to on the water. The new Element seat is nice and the tackle box tray incorporated in it is great! Funny thing, the molded in cup holder is my favorite thing, I guess because the MX didn't have one, Ahh, it's the simple things. Love this kayak and it will be around a few years for sure. This boat is fast, easy to pedal, has a ton of room, and is surprisingly agile for a big kayak. The rudder deployment lever is a major improvement and the reverse is huge when fighting a fish. At slow speeds it almost acts like a brake, and then boom, you're instantly going backwards. I was traveling through and fishing some pretty shallow areas with lots of lilly pads and weeds, the drive lift and deployment system makes is super easy to clean off the prop.